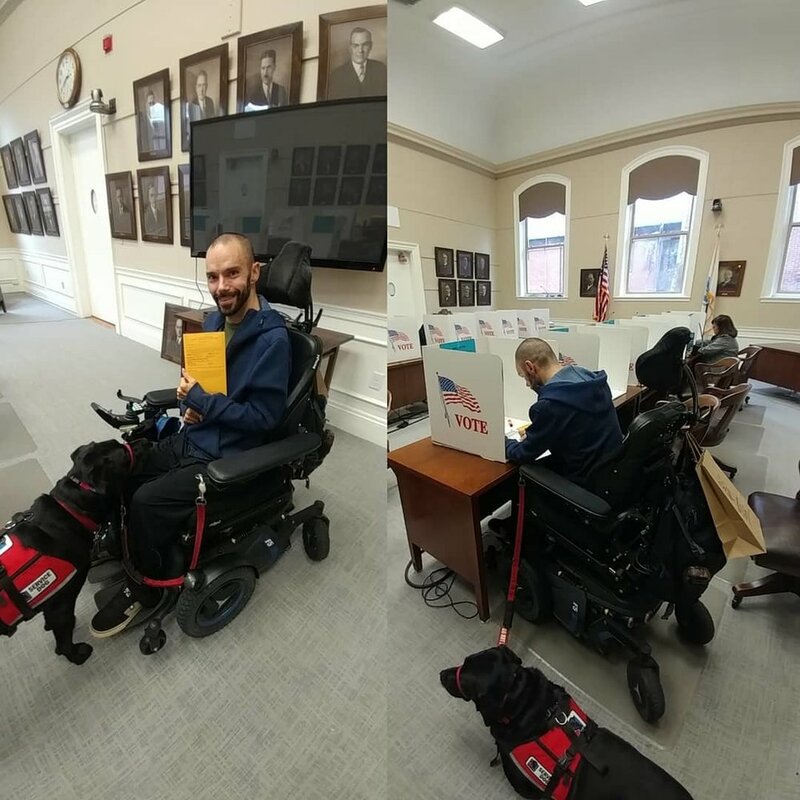 The Greater Boston Chapter of United Spinal Association works to advocate for Spinal Cord Research, ADA rights and for individual rights at the state and federal level often in partnership with our parent organization United Spinal Association. One of the best way to advocate for yourself and your community it to get out and vote! 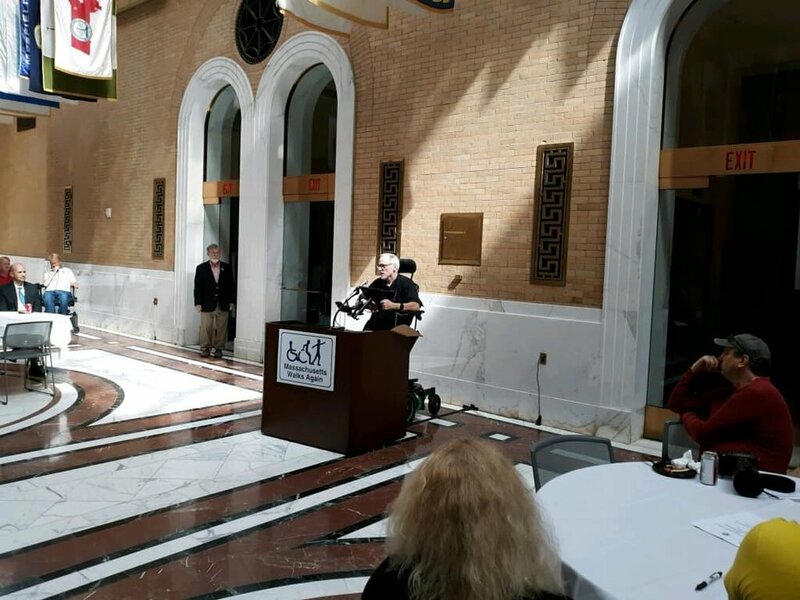 Our Chapter Advocacy Representative and Peer Mentor, Chris spoke to many Massachusetts legislators and other advocates in the community at SCI Awareness Day at the State House. Read his speech here. Many people ask us how they can identify their legislator's contact information, well here is an instructional video on how to identify and contact them. This bill expands provisions prohibiting discrimination against disabled individuals by an air carrier. Specifically, it enumerates certain actions that an air carrier must take or may not take with respect to a disabled individual. It also requires the Department of Transportation (DOT) to ensure that disabled individuals traveling in air transportation are able to file complaints with DOT in response to disability-related discrimination and receive assistance from DOT through a hotline or comparable electronic means. On Feburary 25, 2018 the U.S. House of Representatives passed H.R. 620 the ADA Education and Reform Act. This bill is now waiting to be taken up in the Senate. We need you to take action now and contact your Senators and URGE OPPOSITION to this bill or any similar legislation that attacks the ADA. There is a severe shortage of accessible and adaptable housing in Massachusetts. This causes people with disabilities and the elderly to be forced to live outside their home communities often in nursing homes or state hospitals. Disabled people also face discrimination, and high unemployment rates, because workplaces are inaccessible. Massachusetts can help to address these problems if the Government passes legislation expanding the Commonwealth’s power to require that developers address these needs when planning new construction and renovation of large buildings. Efforts to pass this legislation made great progress in 2018 but stalled in the House of Representatives. Advocates are dedicated to learning from this effort to build a winning campaign in 2019. Please join us . Together we can have a historic victory! Unlike the ADA, State law only requires areas of commercial buildings used by customers be accessible; employee-only areas are not covered. This excludes disabled people from employment opportunities contributing to high unemployment and isolation. Legislation is needed to close loopholes in state law to promote equal access to employment and human rights for all! Make Housing Accessible and Adaptable: Disabled and elderly residents of Massachusetts are being forced to live in nursing homes or become homeless because of the lack of accessible housing. State law currently is not aligned with the ADA, it has a loophole that exempts buildings constructed before 1991 from providing adaptability in large scale housing conversions. Adaptability is the ability to add an accessibility feature without the high cost of structural change. Massachusetts must comply with the ADA to serve the needs of its older and disabled residents ! Have you been in a public building (retail establishments, hotels and motels, multiple dwellings, educational facilities, medical facilities, detention facilities, places of worship, restaurants, and transportation facilities) that are not compliant with 521CMR or Americans With Disabilities Act? Follow the link below to the Architectural Access Board’s complaint page and fill out a form. Chris Speaking to Legislators at Massachusetts State House for SCI Awareness Day. Ryan taking advantage of early voting. Mike at Massachusetts Statehouse with Gov. Baker and Sen. Marc Pacheco.